The Yellow Flame is a deciduous tree growing up to 15 metres high with a trunk diameter of up to 1 metre and a broad umbrella-shaped crown, excellent for providing shade in the garden. 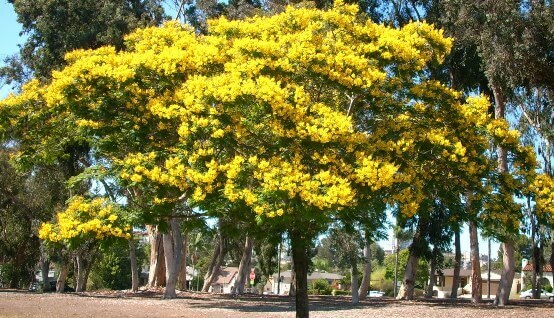 The aromatic bright yellow flowers turn into woody purple-brown pods which fall off the tree after a few months. It is drought-resistant, adapting well to hot environments. This is a popular ornamental tree, often planted on streets for it’s attractive colourful flowers and shady canopy.